Is Your Cat Grooming Itself Properly? Well, if you have a cat or kitten, you really can't miss your cat grooming itself. Felines spend a large part of their waking lives taking care of this task. From the day kittens are born, mama cats starts grooming their kittens and showing them how to do the job themselves. For the most part, cats can take care of this part of their lives, but every now and then they could use a little extra help from their human companions (especially longhaired and semi-longhaired cats). You may have noticed that cats seem particularly flexible and are able to groom their whole bodies. They use all of these tools to accomplish this daily (if not hourly!) task. Cat Grooming Itself-How Do They Do It? A cat's tongue is the number one tool your cat or kitten uses to groom itself. Cat's tongues have little backward facing barbs that grab loose hair and other foreign substances on your cat or kitten's body. 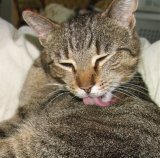 The tongue's rough surface along with cat saliva help to clean your cat's fur. However, even with all their flexibility, cats can't reach everywhere with their tongues. This is where their paws come in handy. You've probably noticed your kitty lick her paws then wipe her ears and other parts of her head. In addition to using his paws like a washcloth, your cat is actually accomplishing something else by using his paws. While wiping with his paws, your kitty is stimulating the glands around his head and picking up some mildly oily secretions to transfer around other parts of his body. These cat gland secretions are later used to mark his territory when he rubs up against things and people—another benefit of your cat grooming itself. While your cat's fur is drying, your cat uses her teeth to put the fur back into place and also to remove any other debris that her licking and wiping didn't get. While your cat or kitten can take care of most of the work, brushing, bathing, and cleaning your cat is sometimes necessary to help out your cat, especially longhaired and semi-longhaired cats, although short-haired cats can use your help, too. Cat excessive grooming—If your cat seems to be excessively grooming itself, this could be a sign of a flea allergy, skin problems, or other cat health issues. Remember, cats groom a lot anyway, but pay attention if your cat seems to be doing it excessively. Cat not grooming itself—It is a normal part of cat health for your cat to groom herself. If she stops taking care of herself, especially after meals, this could be a sign that there is something wrong with your kitty, and you should probably consult with a veterinarian. Cat Grooming Techniques - Tips for helping out your cat or kitten. Cat Grooming Tools - For when your kitty needs a little extra help from you.